Well, it's not so much a "diet" as it is an amazing dessert that I must have. NOW. Basically, I will eat anything that incorporates Jello No-Bake cheesecake. I'm looking at you, Red Lobster. Chocolate for drizzling--some people call for milk or white chocolate, but I like my chocolate like I like my back-alley romances: dark. Wash the berries and hollow out the centers. Use a small paring knife for this or a child with tiny hands and sharp claws (they have claws, right?). Mix the cheesecake according to the directions. Put the cheesecake in a piping bag and fill each strawberry until slightly overfilled. 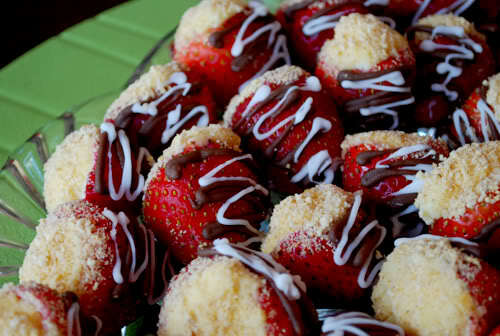 Then, place the graham cracker crumbs into a bowl and dip each strawberry into the crumbs to coat the top. Melt the chocolate in the microwave (if you're a philistine) in 30-second increments, stirring between. Again, transfer to a piping bag with a narrow tip and drizzle onto each berry. Resist the urge to over-drizzle. It's dessert, not Debbie Does Dallas. Refrigerate until you’re ready to eat. When ready, gorge heartily.